Hope's Cafe: Isaac Newton Book Review! As part of BookSneeze I get the opportunity to review Christian books, and this was one that caught my attention. 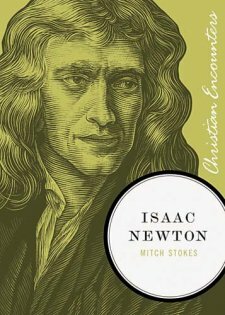 A biography of Isaac Newton, written by Mitch Stokes, this was a great read. This book is part of the Christian Encounters, a series of biographies published by Thomas Nelson. This series details important people from all ages of the Church, some well-known and others not so well-known. Or, in this case, well-known for his scientific and mathematic discoveries, but not much is known about his personal life. Growing up, science was my least liked subject in school, but once I hit late teens, it became more and more interesting. And, of course, you can't study science without learning about Isaac Newton. I was thrilled to have the chance to dig deeper and discover more about Newton, and getting a Christian perspective on his life. So many people make it sound like all the great scientists believe in evolution, or, at the very least, didn't believe in God-so it is refreshing to be able to read a biography of this great man and not have things twisted to sound like he was anything but a man who believed in God and creation! Of course, I love his statement about evolution-"Atheism is so senseless...it never had many professors"-you gotta love it! While reading this book, 2 things jumped out at me. One, the struggles and trials he dealt with his entire life. Yet, through it all, he remained steadfast, never giving up. Second, I was impressed by the amount of his knowledge! Even though at first his push for learning was motivated by other factors, I am still in awe of his intelligence. I was caught by the statement that for relaxation and refreshment he would study "lighter" subjects, and then returning to mathematics, astronomy, optics, etc. The biography is very well written, and definitely held my attention. I would recommend it for older teens and up, as anyone younger (unless sincerely interested in the subject) would probably not be held. Disclaimer: I was not monetarily compensated in any way for this review. I did receive the book for review, as part of the BookSneeze team. All thoughts and opinions are mine. Sounds like an interesting biography...sounds like you learned a lot about him. I like the part where you said that for relaxation and refreshment he studied lighter subjects! He certainly was a very intelligent man. This sounds very interesting, I'd love to read this myself! I'm such a nerd (just ask hubby, he tells me all the time, lol) and I would love to read this too. I haven't ever thought much about his personal life and am very interested now.